The crowd anticipates a big show at Norman Music Festival. Oklahoma is more than a starting point for some of the world’s most celebrated musicians. It’s also the home to many vibrant and unique music festivals. If you think the sounds of the Sooner State are all country and western twang, you might want to take another listen. While our country roots run deep, Oklahoma’s music festivals showcase a wide range of genres, from jazz and heavy metal to classical music and the latest underground sub-genre you haven’t even heard of yet. Whatever pleases your ear, you’ll find it in Oklahoma—where the rock ‘n’ roll is loud, the folk is soulful and the plains are alive with the sound of music. Metro Music Fest has brought local favorites and national headliners to OKC’s Bricktown Entertainment District since it launched in 2009. Presented by the Academy of Contemporary Music at the University of Central Oklahoma (ACM@UCO), this free festival routinely showcases artists from wildly different genres for an eclectic lineup that gets people talking months ahead of the big day. Big-time artists like Moby and Guided by Voices might loom large, but the real stars of Metro Music Fest are the musicians enrolled at ACM@UCO, a fully-certified contemporary music program designed to help students build careers in the music industry. Local musicians range from up-and-coming hopefuls to established Oklahoma heavy-hitters like BRONCHO and Colourmusic. The event began as a way to give ACM@UCO students a platform to showcase their skills in a festival environment, but it has since blossomed into a can’t-miss event highlighting Oklahoma City as a destination for top-shelf national artists and fertile ground for aspiring local talent. Discover the next breakout indie act or catch a set from stalwart veteran rockers at the Norman Music Festival. 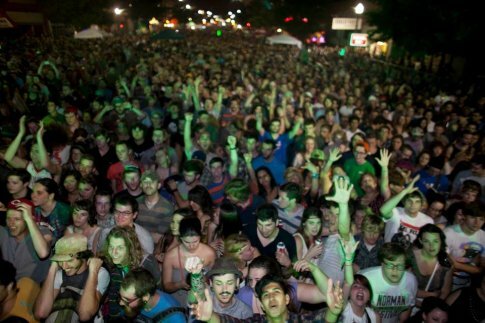 The thriving college town of Norman roars to life for this fun, three-day festival held at various venues throughout town. Since 2008, the Norman Music Festival has grown from a modest, one-day event into the robust and highly-anticipated happening it is today. See an up-and-coming electronic duo at Guestroom Records before catching an outdoor set from a local hip-hop artist like Jabee or contemporary indie rock showstoppers like The Walkmen or Dirty Projectors. Hit all the hotspots in historic downtown Norman and support local businesses at this free festival that includes poetry slams, comedy shows and an open-air market. While you’re there, check out cultural attractions like the Fred Jones Jr. Museum of Art on the beautiful University of Oklahoma campus, or grab a bite from a local institution like the Midway Deli. Travel to the charming town of Grove and see old-time fiddle competitions across multiple stages at the American Heritage Music Festival. This three-day, family-friendly extravaganza takes place in the Grove Civic Center and offers concerts, contests and jam sessions all weekend. Fiddle competition categories include twin fiddle, "anything goes" hot fiddle, flat-picking, mandolin, Honey Creek special, jukebox, Dobro, banjo and more. Bring the family and camp out on the shores of beautiful Grand Lake O’ the Cherokees at this annual roots music event in northeastern Oklahoma. Turn your amp up to 11 at Rocklahoma. This three-day music festival in Pryor brings together the biggest names in rock for a weekend of head-banging good times. See classic 80s-era hair metal bands like Twisted Sister alongside stadium-fillers like ZZ Top, Kid Rock, Guns N’ Roses and more at America’s loudest Memorial Day Weekend bash. Rocklahoma—drawing more than 70,000 attendees and featuring more than 70 entertainment acts across three stages—will get your adrenaline pumping with high-energy performances, thrashing guitars and dazzling pyrotechnic displays. Grab your favorite concert buddy and camp out for three days of rock ‘n’ roll fun in the heart of Oklahoma’s Green Country. In the mood for some bluegrass? Head to the Tallgrass Music Festival in Skiatook for a fun-filled weekend of pickin’ and grinnin’. Top-notch bluegrass artists take the main stage on Friday and Saturday to perform in the traditional style to the delight of audience members who travel from all over for this joyful prairie jam. If your little musician wants to get in on the fun, they can have their moment in the spotlight on Saturday morning during the children’s fiddle competition. Food and craft vendors are always on hand, so there are plenty of reasons to stick around at this fun music event. Located in the heart of Osage County, the Tallgrass Music Festival is a great excuse to check out beautiful Skiatook Lake or take a leisurely drive through the Joseph H. Williams Tallgrass Prairie Preserve. Celebrate the finer things at the OK Mozart Festival in Bartlesville. For more than 30 years, this distinguished music event has showcased a full range of orchestral music by some of Oklahoma’s most gifted musicians. Enjoy classical and chamber music performances, along with a variety of tours, lectures, fun children’s activities and more. Like the town that hosts it, the OK Mozart Festival is bursting with character and charm. While you’re in the Art Deco playground of Bartlesville, you’ll definitely want to stop and grab a bite at Frank & Lola’s or enjoy a cocktail with a view at the gorgeous Copper Bar located at the top of the Price Tower, the only Frank Lloyd Wright-designed skyscraper. Whatever combination of genre, atmosphere and surroundings you’re looking for, there’s a music event in Oklahoma with your name on it. Come be a part of more than three decades of tradition at Jazz in June, Norman’s outdoor jazz and blues festival. Attracting more than 50,000 annual visitors, the self-proclaimed “hippest jazz festival around” features local talent along with national artists like Jon Cleary and Beto & the Fairlanes during a three-night celebration under the stars. Hone your chops at a music clinic taught by talented artists, or jump in on one of the late-night jam sessions peppered throughout Norman. Whether jazz and blues are part of your DNA, or you’re just looking for a fun weekend on the town, you won’t want to miss this music event that has been a part of Norman’s cultural identity since 1984. Can’t get enough jazz? Come to the historic Deep Deuce neighborhood in Oklahoma City for the Charlie Christian International Music Festival. This two-day extravaganza honors the musical legacy of its namesake, a jazz guitar legend who grew up in Oklahoma City and pioneered the sounds of bebop and cool jazz in the 1940s. The Charlie Christian International Music Festival has hosted greats like Isaac Hayes, The Yellowjackets and George Benson, and features food trucks, art vendors and riveting panels lead by distinguished jazz historians. After the festivities, you can take a stroll around the former jazz hub of Deep Deuce and follow in the footsteps of greats like Jimmy Rushing and Charlie Christian himself at dining and nightlife hotspots like Deep Deuce Grill and Stag Lounge. Celebrate one of Oklahoma’s favorite sons at the Woody Guthrie Folk Festival in Okemah. Sit back and enjoy the timeless songs of Woody Guthrie as performed by local and touring artists like John Fullbright, Samantha Crain, the Turnpike Troubadours and more. Come experience four blissful days of music, storytelling, children’s activities and poetry readings at this beloved event honoring all things folk. A trip to the Woody Guthrie Folk Festival is also a great opportunity to trace the steps of the iconic prairie troubadour at the center of its festivities: see where Woody went to school, tour his boyhood home, and take a look at the statue and other artwork celebrating his legacy throughout the charming town of Okemah in northeastern Oklahoma. Music animates the idyllic cobblestone community of Medicine Park. Nestled in the foothills of the Wichita Mountains, this boulder-strewn retreat is home to an eclectic mix of festivals that will have you feeling the magic of Great Plains Country in southwestern Oklahoma. Say hello to Spring at the annual Park Stomp Music Festival, featuring a diverse mix of bluegrass, country, rockabilly, punk rock and more. Come back and get down at the Mayor’s Red Dirt Ball in May, Rockin’ the Park in July and the Mayor’s Blues Ball in September. If you’re not too wiped out from a year of festival-going, return in October for the Medicine Park Flute Festival and Art Walk, a two-day event featuring Native American flute music and a juried art show highlighting local and regional artists. Of course, no trip to the area is complete without a hike through the rugged and beautiful terrain of Charon’s Garden Trail at the Wichita Mountain Wildlife Refuge, a treasure in any season. Local talent is the name of the game at the Plaza District Festival in Oklahoma City. This high-energy festival celebrates established and up-and-coming Oklahoma musicians for a day of art, food, kids’ activities and music in the open air of OKC’s vibrant Plaza District—home to favorite local haunts like Empire Slice House and Bad Granny’s Bazaar, along with newcomers like Goro Ramen + Izakaya. Stroll through the artist booths lining 16th Street and browse an array of paper silhouettes, sculpture, soaps and other one-of-a-kind, hand-crafted items. Be sure to check out the ever-changing Plaza Walls Murals as you enjoy live hip-hop, punk, R&B, Americana, folk rock and more across two stages at this lively outdoor festival. You know that Oklahoma has great music and barbecue, but did you know it’s also home to the world’s largest concrete totem pole? The Totem Pole BBQ & Music Fest in Foyil brings all three together for a summer festival that’s fun for the whole family. Feast on delicious barbecue, browse craft vendor booths and let the kids wear themselves out with fun children’s activities while you enjoy the down-home sounds of fiddles, banjos and acoustic guitars. Ed Galloway’s towering 90-foot totem pole structure welcomes you to this unique event featuring an eleven-sided “Fiddle House” and a museum showcasing other artifacts made by Galloway. Scratch another Oklahoma Route 66 roadside oddity off your list with a visit to the Blue Whale in nearby Catoosa to get the most out of your trip through beautiful northeastern Oklahoma. Get away from it all and enjoy some great tunes at the Stone River Music Festival in Chandler. This outdoor festival is held on private land three miles north of town and features food trucks, family-friendly activities and crafts vendors. The Stone River Music Festival celebrates homegrown artists in a beautiful setting in the heart of central Oklahoma. The festival’s mission is two-fold: to provide a forum for the many talented Oklahoma musicians and to give back to the local music community. Bring a tent or RV and set up camp for the weekend at this annual celebration of all things Oklahoma. Come to G Fest in Muskogee for a three-day summer music celebration featuring the biggest local and national names in Americana. Pitch a tent or pull up at an RV site for the full festival experience as you enjoy music by first-class local artists like John Fulbright, Mike Hosty and the Red Dirt Rangers along with national headliners like NEEDTOBREATHE, the Nitty Gritty Dirt Band and more. Whether you just go for one day, or splurge for the full three-day pass, you’ll be glad you turned out at this highly-anticipated music festival in Muskogee. G Fest is also a great opportunity to see what else Muskogee has to offer. Check out local attractions like the Oklahoma Music Hall of Fame & Museum, the U.S.S. Batfish & War Memorial Park, the Pecan Creek Winery and much more. This snapshot of Oklahoma’s music festivals gives you an idea about the range of exciting events happening all over the state, but there’s still plenty more to discover and explore. Whatever combination of genre, atmosphere and surroundings you’re looking for, there’s a music event in Oklahoma with your name on it. Find a concert or performance near you!